DEAUVILLE, October 18 (KATAKAMI / Itar-Tass) — Russian President Dmitry Medvedev arrived in Deauville on Monday, October 18, for a summit meeting with German Chancellor Angela Merkel and French President Nicolas Sarkozy. The leaders will begin their discussion at a working dinner and then continue it on Tuesday morning. They will speak about its results at a press conference. “The trilateral meeting is not some kind on an exclusive club for working out decisions separately from other states and international organisations, but a convenient format for comparing our common vision in a confidential and frank atmosphere with our closest partners in Europe with which our cooperation is very big,” Prikhodko told Itar-Tass. “We are for the continuation of any useful format. In the opinion of the Russian side, this troika format is useful as an addition to regular Russia-EU, G8 and G20 summits,” the Kremlin official stressed. He cited as an example of such informal summits the Weimar Triangle (France, Germany, Poland) and the Visegrad Four (Poland, Slovakia, Hungary and the Czech Republic). The first such summit was held in Strasbourg in 1998 with the participation of Russia’s first President Boris Yeltsin. After that the troika gathered in 2003, 2004 and 2005. Vladimir Putin represented Russia at those meetings. “We are, certainly, ready for the continuation of such meetings (after Deauville), it is an additional opportunity for us to discuss vital issues without protocol,” Prikhodko said. He did not answer a question why the troika has had a five-year interval in the meetings, and only said that the leaders had decided to gather when everybody was ready for it. “We are interested to continue such meetings,” he said. “High on the agenda of the summit in the Group of Three format are prospects for building a democratic space of equal and indivisible security in the Euro-Atlantic region and Eurasia that should match modern political realities and give joint responses to common threats and challenges,” Prikhodko said. Russia “gives priority to the promotion of the initiative, which President Dmitry Medvedev put forward in 2008 to draft a new European security treaty,” he noted. “I’d like to recall that my idea regarding the signing of a new European security treaty is aimed at this. I’d like this treaty and other efforts taken by our country in the field of security to receive a worthy response in the world,” he stressed. According to Medvedev, “security is important not only for Europe but also for the Asia Pacific Region, for Africa and for America.” “That is why we will continue our efforts in all directions. The task, which is aimed at promoting this international agenda and improving security institutions, is correlated with modernisation of our country, our economy and our political system,” he emphasised. “The purpose of this approach is to overcome the stereotypes and give up previous mentality. I believe that we have succeeded in doing this. Our contacts with the United States of America, Russian-Polish relations, the signing of the Russian-Norwegian border deal in the Barents Sea and other political events testify to this,” he said. The summiteers “will share opinions on the Iranian nuclear problem, primarily in line with the development of positive tendencies that are taking shape after the meeting of the Sextet foreign ministers in New York,” Prikhodko underlined. Alongside, Prikhodko added that the resumption of the Sextet negotiations on the Iranian nuclear problem could hardly be discussed in practical terms at the summit of the leaders of Russia, France and Germany. “We cannot take separate isolated decisions. This is not a prerogative of the Group of Three,” he elaborated. “Medvedev, Sarkozy and Merkel are expected to come out in support of the direct Palestinian-Israeli dialogue,” the Kremlin official said. The Deauville summiteers “will also discuss preparations and will synchronise the positions ahead of forthcoming major foreign political events – an OSCE summit (Astana, December 1-2) and a Russia-EU summit (Brussels, December 7),” Prikhodko added. 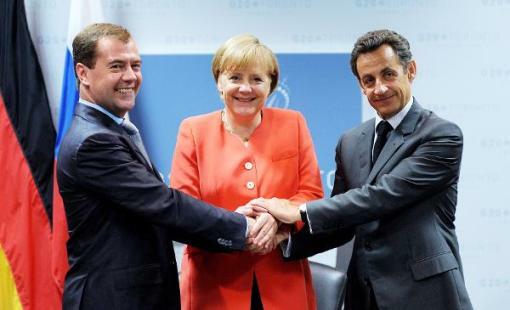 October 18, 2010 (KATAKAMI / RIA NOVOSTI) — Russian President Dmitry Medvedev will meet with French and German leaders on Monday to discuss, among other things, European security and the Russia-EU visa regime. 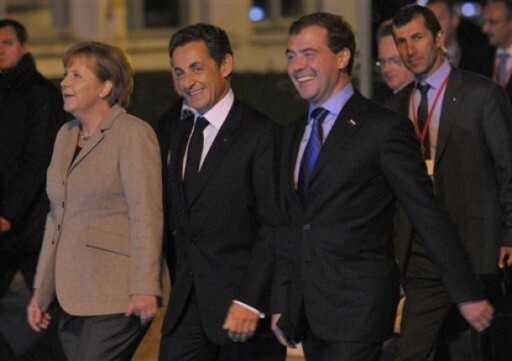 The talks between Medvedev, French President Nicolas Sarkozy and German Chancellor Angela Merkel in Deauville, northern France, would resume after the five-year break with a working dinner on Monday. Three-party consultations are scheduled for Tuesday morning, followed by a joint news conference. “A three-sided meeting is not an exclusive club to work out decisions separately from other states, but rather a convenient format for discussing our common vision in a trustful, frank atmosphere with our closest partners in Europe,” Prikhodko said. Regarding European security, Prikhodko said Russia wants to promote Medvedev’s European security treaty initiative. Medvedev proposed drawing up a new European security pact in June 2008, and Russia published a draft of the treaty in December 2009, sending copies to heads of state and international organizations, including NATO. However, the proposal has been met coolly by Western powers. Prikhodko also said that soonest introduction eased visa regime between Russia and the European Union will be among the key issues on the agenda. “The first issue that we would put forward will be the eased procedure of visa issuance and introduction of advanced methods in data processing,” the Kremlin official said. He did not rule out that Russia may raise the question of scrapping visa regime with the EU, which has become a major foreign policy goal in Moscow’s relations with Brussels. Russia submitted a draft agreement on scrapping visa requirements to the European Union at the Russia-EU summit in the southern city of Rostov-on-Don on May 31. Prime Minister Vladimir Putin said on the same day that “the majority of our partners in Europe support this idea,” but several EU states reject it, mainly for political reasons. Prikhodko said that energy issues, Iran’s controversial nuclear program, as well as Russia-NATO and Russia-EU cooperation would also be discussed at the meeting. German Chancellor Angela Merkel, left, gestures as she walks with Russian President Dmitry Medvedev during their an annual meeting in the Ural Mountains city of Yekaterinburg, about 1,500 kilometers (900 miles) east of Moscow, Russia, Thursday, July 15, 2010. (KATAKAMI / RIA NOVOSTI) Russian President Dmitry Medvedev expressed his condolences to German Chancellor Angela Merkel over German music festival deaths caused by a stampede, Russian presidential press-service said on Sunday. At least 19 people were killed and over 340 injured at the event. The panic at the Love Parade in the western German city of Duisburg started on Saturday evening near the only entrance to the area of the music festival when crowds of the arriving fans of techno music surged through an already jammed entry tunnel. The founder of the Love Parade, Matthias Roeingh, known by the name Dr. Motte, has put the blame on the organizers of this year’s festival saying they made a number of mistakes that inevitably led to the tragedy. “How can you expect to let so many people in through a single entrance? It is scandalous and I am very sad [that it happened],” he said. The organizers of the festival said about 1.4 million people were supposed to attend the event this year. Each year it gathers an increasing number of techno music fans. The Love Parade is considered to be one of the loudest festivals due to the special water-cooled sound equipment producing extremely loud sounds. (KATAKAMI / METRO.CO.UK) Tragedy struck at the dance music event on Saturday after a stampede broke out in a tunnel entrance. It is thought police had been trying to prevent overcrowding at the site after more than one million people turned up for the festival. As thousands more people tried to reach the site through the tunnel, a stampede developed and scores of them were crushed. German authorities have confirmed there were 19 fatalities, but warned the figure could rise as many people suffered serious injuries. Paramedics resuscitated ten people at the scene and around 100 were taken to hospital. As investigations began into why the crush happened, Ms Merkel spoke of the nation’s horror. “Young people came to party. Instead, there was death and injury. I am aghast and saddened by the sorrow and the pain,” she said. Police and organisers ordered the festival to continue as paramedics attempted to treat the casualties and a fleet of helicopters arrived to ferry the injured to hospital. (KATAKAMI / RIA NOVOSTI) German Chancellor Angela Merkel will pay a visit to Kazakhstan’s capital Astana on Sunday for talks with the country’s leadership. The German leader is expected to arrive to Astana on Sunday afternoon. Shortly after her arrival, she will hold talks with Kazakh premier Karim Massimov and attend a business forum involving top businessmen of the two states. A total of 40 bilateral deals are expected to be signed during the forum. Later Merkel will meet with Kazakh President Nursultan Nazarbayev. The two leaders are expected to sign several agreements and give a joint news conference. The German chancellor will fly to Berlin on Sunday evening. BEIJING – JULY 16: German Chancellor Angela Merkel (L) and China’s Premier Wen Jiabao (R) listen to their national anthems during a welcoming ceremony inside the Great Hall of the People on July 16, 2010 in Beijing, China. 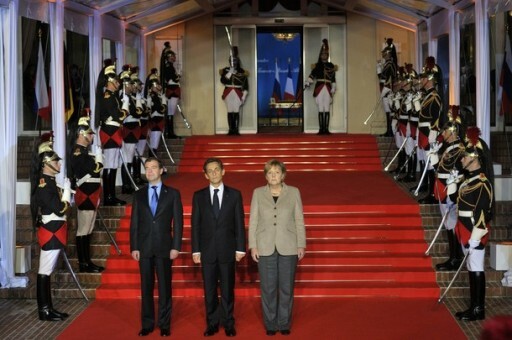 Merkel is on a four-day official vist to China. (KATAKAMI / KREMLIN.RU) Dmitry Medvedev and Federal Chancellor of Germany Angela Merkel discussed bilateral trade and economic cooperation and the implementation of joint investment projects. The two leaders reviewed in detail the foreign policy agenda, the outcome of the recent G8 and G20 summits, the situation in Afghanistan and the Iranian nuclear programme. Mr Medvedev and Ms Merkel agreed to hold a Russian-German Year of Science and Education in 2011 and to launch a joint history textbook project. A number of agreements were signed following the Russian-German consultations in the presence of heads of state. (KATAKAMI / RIA NOVOSTI) The Russian president and German chancellor will meet on Tuesday in the Urals city of Yekaterinburg for a top-level discussion on a wide range of issues — from the Nord Stream gas pipeline project to simplified visa regime. Dmitry Medvedev and Angela Merkel will meet at a working breakfast on Thursday morning, followed by a meeting with Russian and German businessmen. The two leaders will later attend a session of a Russian-German forum St. Petersburg Dialogue currently underway in Yekaterinburg. The Russian-German interstate consultations will begin at noon. Trade and economic relations, the Nord Stream gas pipeline project, simplified visa regime between Russia and the European Union, cooperation between Russian and German regions are on the agenda. An aide to the Russian president, Sergei Prikhodko, earlier said that the two leaders will also address international issues, including violence in Kyrgyzstan, North Korea’s nuclear program and situation in de-facto independent republics of Nagorny Karabakh and Transdnestr. A total of 10 bilateral documents are expected to be signed, including a memorandum of understanding between the Skolkovo foundation, which supervises the eponymous innovation hub outside of Moscow, and Germany’s Siemens AG. The Russian companies Rostekhnologii (Russian Technology) and RusHydro will sign a partnership agreement with Siemens AG to establish a joint venture manufacturing hydroelectric power units. Russian railway monopoly RZD and Siemens will sign a memorandum to establish a joint venture for supply and maintenance of high-speed trains. (KATAKAMI / RIA NOVOSTI) German Chancellor Angela Merkel arrived in the city of Yekaterinburg Wednesday for a meeting with President Dmitry Medvedev. Russian-German consultations are a frequent occurrence, but few are as important for both countries as this meeting. On July 14 and 15, the two sides will essentially be holding a joint cabinet meeting attended by nearly 100 leaders of their largest respective industrial, banking, trade and commodities companies. Also, this is a rare case where Merkel’s political problems back home are pushing her toward greater economic cooperation with Russia in the export, import, commodity and energy sectors, as well as in investment, innovation and modernization. Germany and Russia have overlapping interests in the latter three spheres, which could turn the meeting in Yekaterinburg into consultations on mutual economic assistance. The sides will discuss how they can best help each other, both economically and politically. According to recent polls, support for Merkel’s CDU/CSU faction has fallen to a record low 35%. At the same time, support for the Social Democrats and the Green party has risen to 45%. Growing disenchantment with Merkel in the CDU/CSU was not abated by Germany’s third-place finish at this year’s World Cup. Merkel’s government had hoped the victory would overshadow its fiscal sins, but not this time. It will have to do better than that to turn this tide. Merkel begins her “big eastern tour” in Yekaterinburg – which Europe sees as the gateway to Siberia – in a bid to pave the way for German exports to Russia and Asia, to secure additional contracts for German companies, and to ensure Germany access to reasonably priced energy. She will then travel to China and Kazakhstan in pursuit of these same goals. Before departing for Russia, Merkel’s team indicated that the chancellor sees the trip as a welcome break from her political problems at home as well as an opportunity to integrate Germany into the economic modernization programs under way in Russia, China and Kazakhstan. According to German sources, it was German captains of industry that persuaded Merkel to help Russia modernize its economy and infrastructure so that it will be up to German standards for industrial equipment and product quality. This will allow Russia to purchase more German goods, further stimulating Russia’s economic development. In other words, Germany wants Russia to improve to the point that it needs more highly efficient German equipment. This is self-serving to an extent, but business is business. The German delegation includes the heads of the carmaker Volkswagen, the industrial conglomerate Siemens, the aircraft concern Airbus, the chemical giant BASF, the retail concern Metro, and Germany’s main export-import bank Commerzbank. The sides expect to sign more than a dozen documents in Yekaterinburg, including agreements on Siemens’s involvement in the ambitious Skolkovo high-tech project and on training Russian managers at German universities. However, the focus of the meeting will be railroad projects. Russia and Germany have been working together in this sphere for decades, and now Russian Railways and Siemens are expected to strike a deal that will provide Russia with 240 modern trains worth 2.2 billion euros. The Sapsan high-speed trains running between Moscow and St. Petersburg were also supplied by Siemens, and in 2011 Russia will receive Desiro commuter trains, which will be called Lastochka (Swallow) in Russia. They will run to airports in Moscow and other large cities and will be the primary mode of transportation at the 2014 Winter Olympics in Sochi. Siemens and Synara will supply 220 electric freight locomotives made at the plant in Verkhnyaya Pyshma near Yekaterinburg. Germany expects Russia to reciprocate by accelerating construction of the Nord Stream gas pipeline along the Baltic Sea bed. 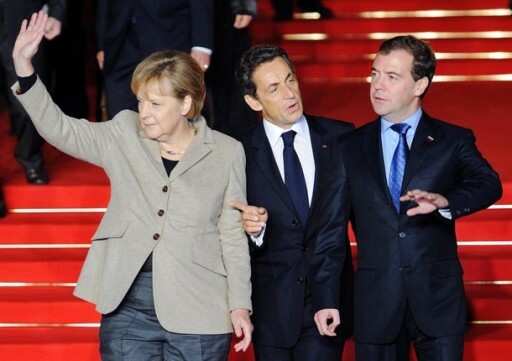 Merkel has reportedly had a separate conversation with Medvedev on this issue. Germany depends heavily on energy and other commodities from Russia. In the first six months of 2010, Germany imported 13% more Russian commodities compared to the same period of 2009, while Russia had to cut its imports from Germany by 7%. Berlin hopes that economic modernization and innovation projects will boost German exports of technology and other goods to Russia. This, in turn, will help Russia to shift its economy toward greater industrial production, consumer demand and, ultimately, more German imports. Russian-German trade and economic cooperation is quite good. According to German statistics, German exports to Russia grew 200% from 2000 to 2009, but fell 40% ($39.9 billion) last year due to the global recession. However, bilateral trade soared by 50% to $15.2 billion from January through April 2010. The political agenda is much more modest compared to the economic one, indicating that Russia and Germany maintain similar positions on key geopolitical and regional issues. Germany supports Russia’s proposal for visa-free travel to the EU, but the decision does not hinge on Germany alone. There is reason to assume that residents of the Kaliningrad Region, Russia’s exclave on the Baltic Sea Coast, will be the first Russian citizens to travel to Europe without a visa, as both Germany and Poland support this move. German Chancellor Angela Merkel and Russian President Dmitry Medvedev. (KATAKAMI / RIA NOVOSTI) Russian President Dmitry Medvedev and German Chancellor Angela Merkel will sign a memorandum of understanding on Russia’s Skolkovo innovation hub, Russian Mayak radio station said Wednesday. 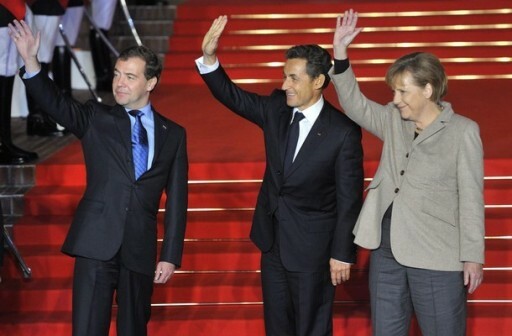 Medvedev and Merkel will meet on July 14-15 in Yekaterinburg as part of Russian-German interstate consultations. The sides are due to sign a memorandum of understanding between the Skolkovo foundation and Germany’s Siemens AG. Medvedev and Merkel are also expected to discuss bilateral trade, economic, cultural and humanitarian ties, and international affairs, and sign more than 10 documents, including a memorandum on a managerial personnel training program, a statement of intent on cooperation in physical education and sport, and an agreement on cooperation between the countries’ public health ministries. They will also meet with Russian and German business representatives. The Russian companies Rostekhnologii and RusHydro will also sign a partnership agreement with Siemens AG on the establishment of a joint venture to manufacture power units. (KATAKAMI / EXPATICA) German Chancellor Angela Merkel will hold trade talks with Russian President Dmitry Medvedev in the Russian city of Yekaterinburg Wednesday, the Kremlin said. The two leaders are to be joined by ministers from their respective governments for the two-day meeting, which will focus on economic cooperation, said the statement Tuesday. Among the business tie-ups to be discussed, the two sides are to discuss a partnership between the Russia’s RJD railway company and Germany’s Siemens, the Kremlin statement added. German government sources say Siemens will sign 2.2-billion-euro (2.8-billion-dollar) order to supply RJD with 200 trains for its regional network. Siemens chief executive Peter Loescher will be one of the 25 business leaders accompanying Merkel to Russia and on to China and Kazakhstan in what will be a four-day tour announced last week by her office. The two countries will also discuss the controversy of Iran’s nuclear programme, the situation in Iran, the Afghanistan conflict and Russia’s relations with the European Union. Germany may also raise the issue of human rights: Thursday will be the first anniversary of the murder of journalist and human rights activist Natalia Estemirova. Her body was found in Ingushetia hours after she was abducted from Chechnya, in the Russian Caucasus. (KATAKAMI / RIA NOVOSTI) Russian President Dmitry Medvedev and German Chancellor Angela Merkel will discuss bilateral trade, economic, cultural and humanitarian ties, as well as international affairs, a Russian presidential aide said on Tuesday. “Our priorities include European security, Russia-EU and Russia-NATO cooperation, and the implementation of G-8 and G-20 decisions,” Sergei Prikhodko said. On Thursday, Medvedev and Merkel are to meet with representatives of Russian and German business circles. Prikhodko said as a result of the interstate consultations, Russia and Germany will sign more than 10 documents, including a memorandum on a managerial personnel training program, a statement of intent on cooperation in physical education and sport, an agreement on cooperation between the countries’ public health ministries, and a memorandum of understanding between the Skolkovo foundation and Siemens AG. Russia’s Rostekhnologii and RusHydro and Germany’s Siemens AG will also sign a partnership agreement on the establishment of a joint venture to manufacture power units. German Chancellor Angela Merkel and Britain’s Prime Minister David Cameron (R) watch the 2010 World Cup second round soccer match between Germany and England on television during a break in the G20 Summit in Toronto, Ontario, June 27, 2010. (BBC) German Chancellor Angela Merkel has won the backing of her coalition cabinet for a fiscal austerity programme. Berlin will cut the budget deficit by a record 80bn euros ($96bn; £66bn) by 2014. The plan would cut the deficit by around 3% of GDP. The total deficit in 2009 was 3.1%, but is projected to grow to over 5% this year. “Germany has an outstanding chance to set a good example,” said Mrs Merkel. Among the measures agreed were a cut in subsidies to parents, 10,000 government job cuts over four years, and higher taxes on nuclear power. The three-party cabinet also made one high-profile cut close to home, when it agreed to postpone plans to rebuild the baroque Stadtschloss palace in the heart of the capital city. However, many economists – notably US Nobel laureate Paul Krugman – have been highly critical of German budget plans. They argue that with so many of the southern European governments under pressure from markets to slash spending, German budget cuts are the last thing that the European economy needs. Moreover, Germany has run a large trade surplus with other European economies in recent years. Economists say that this surplus helped exacerbate the debt problems that built up southern Europe, and now needs to be reversed. However, if German households and companies do not increase spending, then the government’s budget plans will actually exacerbate the country’s surplus.